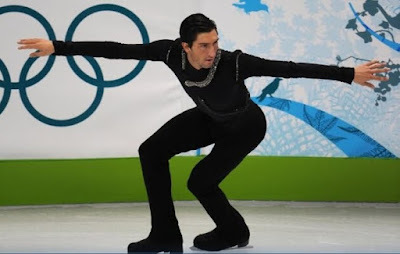 TNR -- TV News and Reviews: Evan Lysacek Takes Men's Figure Skating Gold!! As a Chicago girl, I've got to be thrilled that Naperville native Evan Lysacek just took home the gold in men's figure skating. With both strong jumps, stellar spins, and elegant artistry, Evan beat out Russian favorite Yevgeny Plushenko. Winning the free skate program by nearly 2 points, Evan Lycacek edged past Plushenko's total score by 1.31. Counting on his landed quad jump to win him gold, Plushenko skated with sass, playing to the crowd, obviously confident he had the win. But a few shaky landings on his jumps and some lesser footwork left him a little bit shy of Evan Lysacek's solidly landed jumps and complicated choreography. As figure skating legend Scott Hamilton said, "Plushenko has one thing; Lyscacek has everything." American figure skater Johnny Weir also turned in a nearly flawless program, landing all of his jumps beautifully and only maddeningly getting his skate caught in a rut-- during a spin of all things. Dressed in one of his trademark flamboyant costumes, a beautiful black and white sequined number designed to highlight every curve of a skaters body, Weir made a strong artistic statement on the ice. 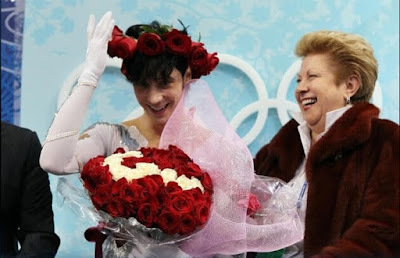 Known for his outspoken nature and sometime crazy sound bites, Johnny Weir had made it clear from the start that he was taking this Olympics seriously. It was obvious at the end of the program that Weir was thrilled with his performance--as he should be. He was confident and fluid on the ice; just a joy to watch. When he received yet another unfairly low score, which the commentators again remarked on, the Olympic audience booed. Weir graciously motioned for the crowd to silence their boos--he knew he skated an excellent performance he can be proud of, and that's what matters. Figure skating often doesn't turn out as we expect, for even though Switzerland's Stephane Lambiel and Canada's Patrick Chan scored much higher than Japan's Daisuke Takahashi, his 90+ point short program landed him the bronze. Weir's free skate program was only a couple tenths off of Takahashi's, yet Weir ended up in 6th place. Fourth place Lambiel skated a solid program, landing all of his jumps and executing some of his amazingly speedy spins. Unfortunately nerves seemed to have taken hold, and we lost the free, limber, fluid qualities Lambiel is so known for. 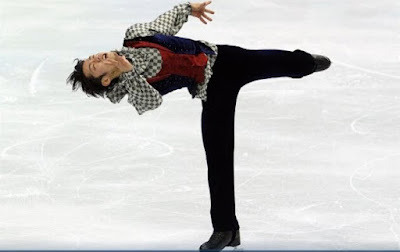 Had Lambiel been up to his usual confidence level, he could have easily landed himself a metal. Though he lost the quad at the beginning of his run, bronze medalist Daisuke Takahashi picked himself up and finished his program with enough strength and artistic impression to keep him in the running. A sure sign of Olympic spirit, and a lovely program. The fact that so many men fell on the quad or nervously eliminated it from their program, and the fact that Lyscacek won gold without the quad, makes me hope that future competitions will inlcude less of these near-impossible feats and more of the elegance and artistry of figure skating that we love. Congratulations to all of the medal winners, and big love to the American skaters Evan Lysacek, Johnny Weir, and 9th place Jeremy Abbot. Three figure skaters in the top ten of the world is not too shabby. PHOTOS: American figure skater Evan Lysacek; American Johnny Weir; American Johnny Weir again; Canadian Patrick Chan; Japanese skater Daisuke Takahashi, American gold medalist Evan Lysacek again; Men's Figure Skating Free Skate Program, 2010 Vancouver Winter Olympics, c2010 NBC.